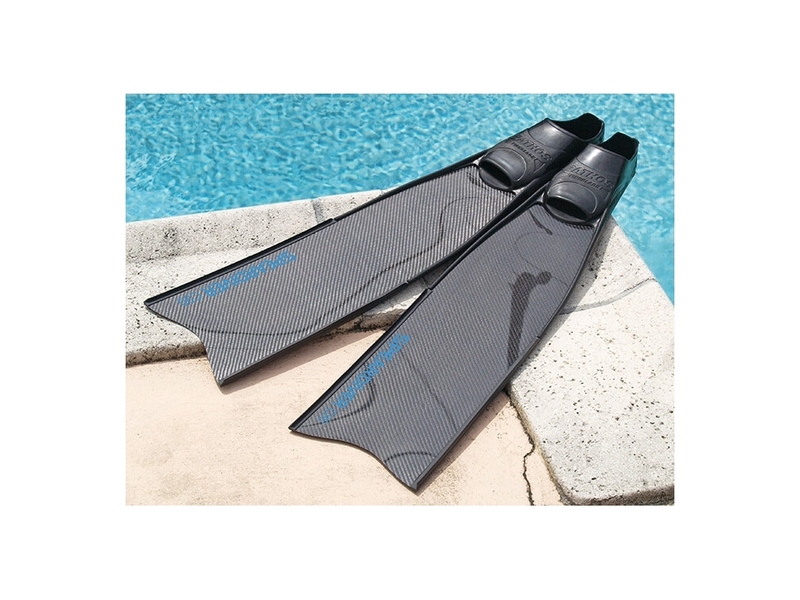 Pair of Speardiver carbon 90cm spearfishing fins with OMER Stingray or Cressi Gara Modular foot pockets. Carbon fiber fins are universally accepted as the best performing fins for spearfishing and freediving. Carbon fins are faster and weigh less than plastic and fiberglass fins. Faster refers to how quickly the fins release the stored energy acquired from being flexed, in other words how they instantly spring back to straight in the water after your kick, resulting in superior propulsion. Being lighter carbon fins are easier to kick allowing divers to swim for longer periods of time without tiring out the legs. The manufacturing process and materials (carbon fiber and resin) used in the production of carbon blades, must result in blades that are consistent in stiffness and flex characteristics, and most importantly durable. This is no simple task for aspiring small companies offering their single product (fins) in today's satrurated carbon fins market. 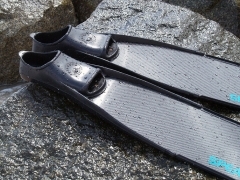 Speardiver fins are part of Speardiver's complete line of proven high quality spearfishing gear, and have met these criteria since their introduction in 2009. Attention to small but very important details such as correct blade surface area (blade length and width), correct toe angle, and quality water channeling rails and rails for installation in foot pockets, have put Speardiver fins ahead of the competition. Our experience with practically all foot pockets available, enables us to manufacture carbon blades that will combine well with different foot pockets, to precisely meet the requirements of an individual diver. 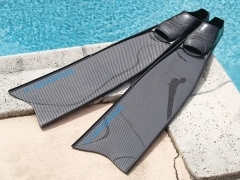 Read reviews from divers using our carbon fins Speardiver carbon fins roll call. Two year warranty on the carbon blades, against failure under normal conditions of use. 25º built in toe angle. Water channeling rails for stabilization. Foot pocket rails for easy installation of the blades in foot pockets. No gluing is needed. Medium soft (MS) A very light blade suitable for experienced divers who can get the same propulsion out of a soft blade using proper kicking form, and for divers who get knee and ankle pain from stiffer blades. Medium (M) A light fast blade for all around diving. Medium hard (MH) A stiffer blade for divers who prefer a stronger kicking style. A stiff sole for good energy trasnfer from leg to blade. You'll recognize a sole that's too soft when you feel pressure under your foot from the back edge of the blade with every kick. Foot pocket tendons of moderates stiffness, providing good support for the blade without negatively affecting its flex characteristics. All replaceable foot pockets use the rail system for installing blades in the foot pockets. The foot pocket rails are different than water channeling rails. Water channeling rails are improtatnt for stabilizing the fin in the water and protecting the blade edges against impact, without adding unnecessary weight to the blade. Most manufacturers cut corners with this aspect of fin making, using a single type of rail for both water channeling and foot pocket installation. We designed and manufactured the Speardiver foot pocket rails specifically for this task. Foot pocket rail shape is important for ease of installation of the blades in the foot pockets, and the holding power of the foot pocket tendons over the blade. Read more about rails here Fin blade rails explanation. In addition to the rails OMER Stingray and Cressi Gara Modular foot pockets use an installation kit to securely fix the blade in the foot pocket. The kits, consisting of two plastic plates and two stainless steel screws, require two holes in the blade near the toe angle. The holes will be in different positions for different foot pockets. If it becomes necessary to install the blades in different foot pockets, it's not recommended to make another set of two holes too close to the old ones. * Installation using a foot pocket kit (screws and plate) is considered an alteration to the blades. We will not refund or exchange altered blades. If you're not sure of your foot pocket size, which foot pocket or which blade stiffness you need, contact us before ordering.